CaseCruzer boosts school curriculum and technology goals with its new mobile SmartCruzer USB 30 iPad Charging Station. Designed for multiple Apple tablets - including iPad Minis, the reusable case protects against theft while providing storage for fleets of tablets that are essential to innovative education. The USB 30 iPad Charging Station protects vertical tablets from shock, impact and vibration – so when teachers roll it between classrooms or travel to scholastic events, tablets are safely guarded. And an interior lid fitted with four stainless steel flanges can be padlocked for security even while iPads are charging. During inactive times or in transit via plane, train or van, the anti-theft exterior lid is sealed with seven padlocks. All models include embedded wheels and a pullout handle for swift steering. Technology and Curriculum Directors agree that the charging station could not be any easier to use. The SmartCruzer USB 30 iPad Charging Station allows educators to quickly plug the Apple charger/cable into the safe USB 30 Port 110V AC power surge protector built into the case. Set-up is fast, functionality is exceptional, school officials say. “I just wanted to let you know that we have received the cart. I just got done setting it up, and I wanted to comment on what a fantastic product it is. The ease of ordering, the speedy delivery, look and functionality is exceptional. I guess I’m asking if there is a survey I can complete to offer a 5-star rating for you, your company, and your product,” says Kyle Gunderman, of Delaware Valley School District. iPad 30 USB Charging Station dimensions are 33.75" L x 28.50" W x 16.50" H. When empty, the case weighs only 69 lbs. All units include an ambient pressure equalization valve, high-quality latches, and O-ring seal that make the station watertight, airtight and dustproof. This is an Ez-Pack 'N' Ship product that is safe to transport via airlines, FedEx and UPS. CaseCruzer also customizes charging stations for school districts that prefer other tablet brands. iPad 30 USB Charging Station is available in black only. “Technology is expensive and many school Curriculum Directors, Principals and technology leaders must be selective when making purchases within their budgets. Our goal is to help educators protect their investments with transport solutions that are user-friendly and tailored to modern economic demands,” says Tatiana Briceno, CaseCruzer Marketing Director. The SmartCruzer mobile charging station is a complement to the ongoing innovations of Apple. Teachers and students have long praised the iPad and iPad Mini for inspiring creativity and expanding the learning experience. Unlike traditional textbooks that quickly become obsolete, a tablet with various apps allows teachers to update and customize learning materials to keep students engaged, allow them to interact with the material and be passionate about school. 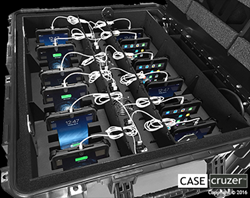 CaseCruzer also expresses a world of possibilities by developing rugged, protective charging solutions for the 21st Century. The presence of the case in classrooms is a reminder that great ideas survive when surrounded by supportive, custom-made accessories. 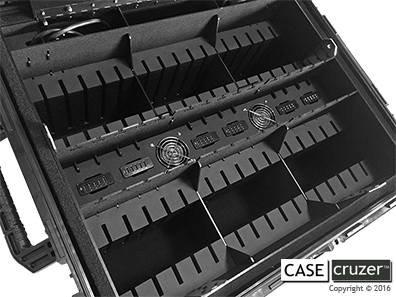 SmartCruzer, another innovative brand by CaseCruzer, provides the drone, media and technology communities with cutting edge storage, transport and mobile charging solutions. For more information on the drone charging station, please visit http://www.casecruzer.com; call 800-440-9925 in the U.S. or 909-613-1999 internationally; fax 909-465-5598; or write to CaseCruzer at 4665 State Street, Montclair, CA 91763.